The Chairperson of the OSCE Permanent Council, Greek Ambassador Mara Marinaki, said the OSCE Chairmanship had suspended negotiations on a continued OSCE presence in Georgia until further notice. Marinaki made the announcement in Vienna at today's meeting of the Permanent Council, one of the 56-country OSCE's main decision-making bodies. The talks began at the end of last year, when the OSCE participating States did not reach consensus on renewing the mandate for the OSCE Mission to Georgia. "Following five months of intensive informal negotiations, it is now time to take stock of what has been accomplished," Marinaki said. "We need to review the results of our efforts to build the required consensus around the Greek proposal based on the 'status-neutral' formula that would allow the OSCE to continue its crucial work in Georgia. We have repeatedly said we need more, not less, OSCE in the region. We call on all participating States to show strong political will to this end." 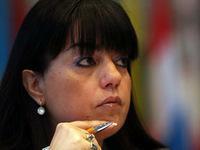 She said that the Greek OSCE Chairmanship's may 8 proposal remained on the table. "Despite the suspension of the talks, we remain hopeful that we will still be able to reach consensus soon," she said. The OSCE Mission to Georgia, which opened in 1992, is in a process of discontinuation. The OSCE also has 20 unarmed military monitors in Georgia who are operating under a mandate that expires on 30 June. The OSCE is a co-chair of the Geneva Discussions along with the United Nations and the European Union. Greek Ambassador Charalampos Christopoulos, the Special Representative of the OSCE Chairperson-in-Office, will participate in the fifth session of the discussions, to be held in Geneva.